Description: Early’s army, bloodied by its defeat at Opequon (Third Winchester) on September 19, took up a strong defensive position at Fisher’s Hill, south of Strasburg. General Location: On heights north and south of rte. 601 and Tumbling Run from the river to the Back Road; hamlet of Fisher's Hill is marked on contemporary maps. Forces Engaged: [c] Four infantry divisions (Wharton, Gordon, Pegram, Ramseur), one cavalry division (Lomax), about 9,500; [u] Three infantry corps (Wright, Emory, Crook), Averell's cavalry division, about 29,444. Casualties: [c] 1,235 (30k/210w/995m&c); [u] 528 (52k/457w/19m). 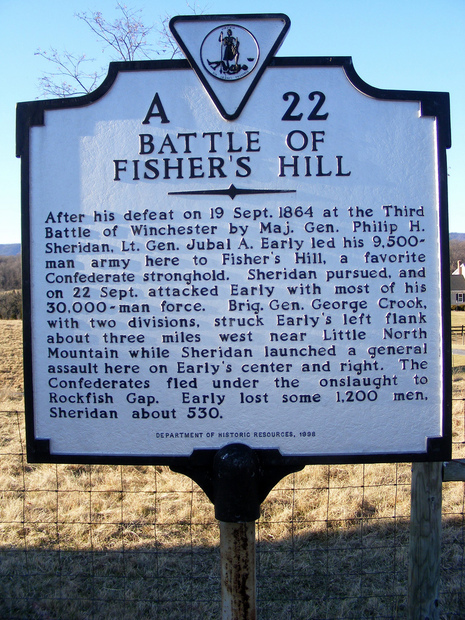 Significance: Lt. Gen. Jubal Early was ``outgeneraled'' by Maj. Gen. Philip Sheridan at Fisher's Hill. Although the casualty figures were not high, this battle was a masterpiece of maneuver and surprise. Sheridan's flanking attack brought Crook's corps to the left rear of Early's position on Fisher's Hill and threw the CS army into a panic. Confederate defeat at Fisher's Hill (on the heels of defeat at Opequon) opened the Shenandoah Valley to a US advance that reached beyond Staunton. When Sheridan withdrew during the first part of October, his army systematically burned mills, barns, crops, and forage, and ran off livestock. By implementing this strategy of ``total warfare,'' Sheridan felt that he accomplished the primary objective of his campaign--to deprive the Confederacy of the agricultural abundance of the Valley. Phase One. CS Dispositions (19-20 September): After its crushing defeat at Winchester on 19 September 1864, the CS army withdrew to Fisher's Hill. The US army pursued as far as Hupp's Hill on 20 September and massed near Strasburg. The Confederate position at Fisher's Hill was a strong one, particularly at the center and on the right flank. Wharton's division, on the Confederate right flank, entrenched along the high bluff overlooking Miller's bottom extended to the left to cover the Valley Pike (old alignment). Gordon's division deployed from the Valley Pike across Manassas Gap Railroad to near the Middle Road above the hamlet of Fisher's Hill. Pegram's division (formerly Ramseur's) was to Gordon's left, and Ramseur's division (formerly Rodes's) extended the line west to a high hill south of Tumbling Run South Fork (referred to a ``Ramseur's Hill'' in this report). The CS cavalry under Lomax extended the main line northwest to and beyond the Back Road. Lomax's position was held with little more than a skirmish line. To mask these deployments, Lt. Gen. Jubal A. Early placed a strong skirmish line on the hills north of Tumbling Run (Quarry Hill, Flint Hill, School House Hill). General Early had his headquarters at the Widow Funkhouser house on the Valley Pike. Confederate signal stations on Massanutten (Signal Knob) and Round Hill offered wide-ranging views of any Union moves against this line. Early's artillery commanded all approaches along the pike, the railroad, and the Middle Road. The advanced CS positions north of Tumbling Run were not supported by artillery. A brigade of CS cavalry and a battery of horse artillery were placed on Sandy Hook east of the North Fork Shenandoah. Phase Two. US Advance (21 September): About noon, 21 September, Sheridan advanced his army south and west from Strasburg, massing the bulk of the VI Corps in a horseshoe opposite the CS right center on the plateau north of Flint Hill, its left at the Manassas Gap railroad. The XIX Corps, weakened from the battle of Opequon, was placed on the US left east of the railroad with a skirmish line extending back through Strasburg to cover the fords over the Shenandoah North Fork and the road to Front Royal. The line of these two corps was entrenched. Crook's corps (nominally the Army of West Virginia) was held in reserve and out of sight of Signal Knob ``in the timber near Strasburg.'' Wright (VI Corps) established his headquarters in the Amos Stickley House (near the intersection of rte. 757 and I- 81). Averell's cavalry division covered the Back Road. The rest of Sheridan's cavalry was sent via Buckton Ford and Front Royal to advance up the Luray (Page) Valley. Sheridan established headquarters at the George Hupp House just north of Strasburg. Phase Three. Capture of Flint Hill (21 September): As US soldiers entrenched their new position, skirmishing heated up. Sheridan and Wright surveyed the land but could see little of the main CS line because of two intervening hills, called ``Flint Hill.'' These hills were defended by a reinforced skirmish line barricaded behind ``hog'' or ``bull pens'' (U-shaped barricades made of fence rails that sheltered three men). Sheridan ordered Wright to take the hills so that he would have an ``unobstructed view.'' Two regiments (126OH and 139PA) advanced but were thrown back. Reinforced by a third regiment, they tried again without success. The First Brigade/Second Division (five New York and Pennsylvania regiments) was brought into battle line and swept forward under command of Col. J. M. Warner (formerly commander of the Vermont brigade). The hills fell quickly. General Wright described this movement as ``of the greatest importance to the operations of the next day, as it gave us a view of the enemy's line and afforded excellent positions for artillery, of which we availed ourselves in the more important struggle of the 22nd.'' Warner's men threw up rifle pits and bivouacked on the hills within rifle-musket range of the main CS line south of Tumbling Run. Phase Four. US Battle Line Advanced (21-22 September): During the night, Sheridan extended his line westward with Ricketts division on the far right, Getty next, and Wheaton connecting with the XIX Corps at the railroad. After sunrise, Crook's corps was brought forward, following ravines and staying in timber to be out of sight of the CS signal stations. Shortly before noon, Ricketts division (VI Corps) moved to possess the heights overlooking the North Fork of Tumbling Run, while Averell's cavalry division advanced on the Back Road to establish a connection with Ricketts's right flank. Keifer's brigade assaulted and carried the two hills south of the run (School House Ridge), driving CS skirmishers back on their main line. Union skirmishers were pushed to within range of the CS works and began laying down a steady fire. Ricketts formed his division behind the crest of the hills and awaited Crook's attack. In the meantime, about 1215 hours, Emory (XIX Corps) rushed Quarry Hill on the left with a brigade and seized the CS rifle- pits there. 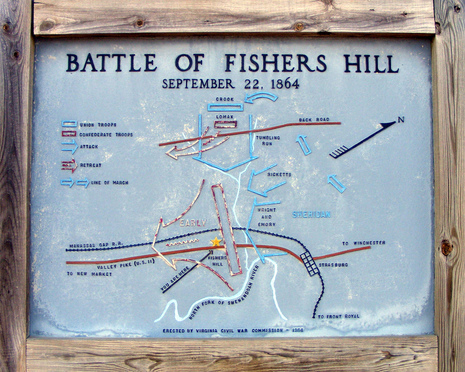 His men immediately reversed the entrenchments, giving the Union army an unbroken line of rifle pits, extending from Quarry Hill across Flint Hill, confronting the main CS line on Fisher's Hill at a range of about 500 yards; skirmishing erupted along the line. 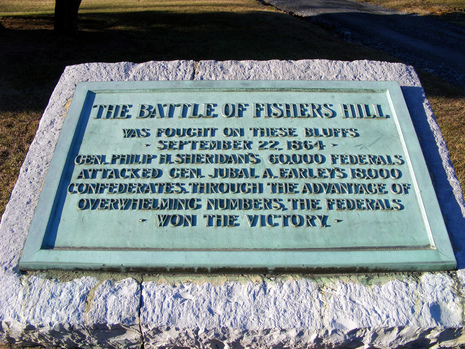 US batteries were brought up, and an artillery duel erupted in the vicinity of the village of Fisher's Hill. Skirmishing continued until about 1600 hours. Phase Five. Crook's Flank Attack (22 September): During the morning Gen. George Crook moved his two divisions (about 5,000 men) to the base of Little North Mountain beyond St. Stephens Church, unseen by the Confederate signal station on Massanutten Mountain. About 1400 hours, Sheridan directed him to commence a flanking movement along the shoulder of the mountain. Crook formed his corps in two parallel columns and marched south until more than half of the command was beyond the Confederate left flank, which was held by Lomax's cavalry division. Crook encountered only scattered fire from a few surprised pickets. About 1600 hours, Crook ordered his columns to face left and to charge. The soldiers charged down the side of the mountain, shouting at the tops of their lungs. The CS cavalry took to their horses and scattered. In their rush down the hill, Crook's divisions lost all order; a mass of men funneled through the ravine of the Middle Fork of Tumbling Run past the Barbe House and closed on the Confederate infantry on ``Ramseur's Hill.'' A second mass funneled to the right along an old road that penetrated to the rear of the Confederate positions. Grimes's brigade of North Carolinians held out against Crook's onslaught until Ricketts ordered his division forward. Hearing, more than seeing, that they were flanked, CS defenders along the remainder of the line began abandoning their entrenchments. Battle's CS brigade was sent to the left to confront Crook but was misdirected into a ravine and missed the fighting altogether. Sheridan advanced his other divisions, the men attacking generally up the ravines. Early's army was soon in full flight, abandoning equipment and 14 artillery pieces that could not be extricated from the works. Phase Six. Rear Guard Action at Prospect Hill (22 September): The CS army was a shambles but attempted to collect itself at the base of Round Hill on the Valley Pike. Generals Gordon, Ramseur, and Pegram and staff officers established a rear guard of artillery and infantry at Prospect Hill and held off the disorganized Union pursuit. During this action, Col. Alexander ``Sandie'' Pendleton, Stonewall Jackson's favorite staff officer, was wounded; he died the following day in Woodstock. The CS army retreated to Narrow Passage, and the wagon train went on to Mt. Jackson. Darkness and confusion among the Union victors prevented effective pursuit. During the fighting at Fisher's Hill, a CS cavalry division turned back the Union cavalry at Milford (present day Overall) in the Luray Valley, preventing an attempt to gain Early's rear by crossing the gap to New Market. Sheridan remarked that if his cavalry had been successful, he could have captured Early's army. The excellent state of preservation and the existing rural character make the study of this battlefield pleasant as well as informative. The battlefield can be interpreted mostly from public roads using about four vantage points, although the best- preserved Confederate entrenchments are on private property. The hamlet of Fisher's Hill retains a historic appearance that includes an old mill (Keller's Mill) and other structures of Civil War vintage. Rte. 601 from rte. 623 (Back Road) to US 11 (Valley Pike) is a pristine rural landscape, except for a short stretch of trailers and a few modern houses west of but out of sight of ``Ramseur's Hill.'' I-81 is conducted over rte. 623 with no interchange and is not intrusive at ground level but becomes intrusive if one climbs the hills adjacent to it. In 1990, the Association for Preservation of Civil War Sites (APCWS) acquired about 195 acres of land west of and adjacent to I-81 and north and south of rte. 601. (The parcel of land south of rte. 601 is referred to as ``Ramseur's Hill'' in this report.) This was where the Confederate infantry met Crook's flank attack from the west and the assault of Ricketts' division from the north. The parcel of APCWS land north of rte. 601 was the scene of preparatory skirmishing and a staging area for Ricketts' division. Access to Ramseur's Hill provides an important vantage point for understanding and interpreting the battle. Traces of Confederate entrenchments remain on the hill. This area, although critically important in understanding the action, is visually degraded by I-81. A vantage point slightly north of the intersection of rtes. 639 and 757 allows interpretation of opening phases of the battle and offers views of Flint Hill (actually two hills, separated by rte. 757) assaulted on 21 September. The Emanuel Evangelical Church above the hamlet of Fisher's Hill offers a sweeping panorama of the CS positions south of Tumbling Run. Many historic structures, including the Eastep and Barbe houses, a brick house (S. Funkhouser house) at the base of Ramseur's Hill, Keller's Mill, Stickley's Mill, and the Miller House are along rte. 601 in Tumbling Run valley. The Widow Funkhouser House site, Early's headquarters, is on US 11 (vintage of current house was not determined). Stone fences remain near the shell of the Jacob Funk house and barn, built by one of the county's first residents in the mid-1700s. Sections of the fieldworks on Fisher's Hill are extant with some segments in a good state of preservation. Portions were bulldozed years ago where the entrenchments extended across pastureland, although in some cases shallow traces remain. Works overlooking the old bed of the Valley Pike are in good condition. The line of entrenchments should be professionally surveyed. Near the intersection of rtes. 11 and 601 the abutments of the old stone Valley Pike bridge remain. The old road trace climbs the face of the hill and in places is supported by stone retaining walls. New construction activity in the area has been slight. Several local landowners have erected modern houses for themselves or their families along rte. 601. There is a large trailer park along US 11 but behind Fisher's Hill, where it is not particularly intrusive. Several new homes have been built at the base of Flint Hill and in the vicinity of the intersection of rtes. 639 and 757, degrading the ability to interpret the battle's initial phases. There is a short strip of modern housing along rte. 757 south of Fisher's Hill. Based on interviews with several local landowners, there was general approval of the recent APCWS acquisition and a strong consensus that new development in the area should be excluded. The major visual intrusion in the battlefield is I-81, which prompted the field surveyor to lower the integrity rating from good to fair. Any future move to widen I-81 or to provide an interchange would severely impact the battlefield's integrity.